The Sonoran Desert (Spanish: Desierto de Sonora) is a North American desert which covers large parts of the Southwestern United States in Arizona and California and of Northwestern Mexico in Sonora, Baja California, and Baja California Sur. It is the hottest desert in Mexico. It has an area of 260,000 square kilometers (100,000 sq mi). The western portion of the United States–Mexico border passes through the Sonoran Desert. The Sonoran desert wraps around the northern end of the Gulf of California, from Baja California Sur (El Vizcaíno Biosphere Reserve in central and Pacific west coast, Central Gulf Coast subregion on east to southern tip), north through much of Baja California, excluding the central northwest mountains and Pacific west coast, through southeastern California and southwestern and southern Arizona to western and central parts of Sonora. It is bounded on the west by the Peninsular Ranges, which separate it from the California chaparral and woodlands (northwest) and Baja California Desert (Vizcaino subregion, central and southeast) ecoregions of the Pacific slope. To the north in California and northwest Arizona, the Sonoran Desert transitions to the colder-winter, higher-elevation Mojave, Great Basin, and Colorado Plateau deserts. To the east and southeast, the deserts transition to the coniferous Arizona Mountains forests and Sierra Madre and Sierra Madre Occidental pine–oak forests at higher elevations. To the south the Sonoran–Sinaloan transition subtropical dry forest is the transition zone from the Sonoran Desert to the tropical dry forests of the Mexican state of Sinaloa. 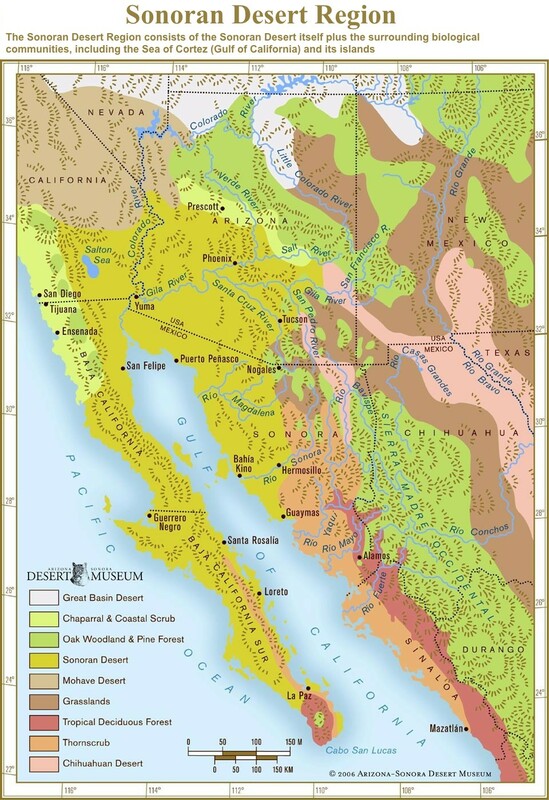 The desert's sub-regions include the Colorado Desert of southeastern California; and the Yuma Desert east of the north-to-south section of the Colorado River in southwest Arizona. In the 1957 publication Vegetation of the Sonoran Desert, Forrest Shreve divided the Sonoran Desert into seven regions according to characteristic vegetation: Lower Colorado Valley, Arizona Upland, Plains of Sonora, Foothills of Sonora, Central Gulf Coast, Vizcaíno Region, and Magdalena Region. Many ecologists now consider Shreve's Vizcaíno and Magdalena regions, which lie on the western side of the Baja California Peninsula, to be a separate ecoregion, the Baja California Desert. Within the southern Sonoran Desert in Mexico is found the Gran Desierto de Altar, with the Reserva de la Biosfera el Pinacate y Gran Desierto de Altar ('Pinacate National Park' in Mexico), extending 2,000 square kilometers (770 sq mi) of desert and mountainous regions. The Pinacate National Park includes the only active erg dune region in North America. The nearest city to the Reserva de la Biosfera el Pinacate y Gran Desierto de Altar is Puerto Peñasco ('Rocky Point') in the state of Sonora, Mexico. The Sonoran Desert includes 60 mammal species, 350 bird species, 20 amphibian species, over 100 reptile species, 30 native fish species, over 1000 native bee species, and more than 2,000 native plant species. The Sonoran Desert area southeast of Tucson and near the Mexican border is vital habitat for the only population of jaguars living within the United States. The Colorado River Delta was once an ecological hotspot within the Sonoran desert, fueled by the flow of fresh water through the Colorado river in this otherwise dry area, but the delta has been greatly reduced in extent due to the damming and use of the river upstream. The Sonoran Desert near Tucson, Arizona during winter. Many plants not only survive, but thrive in the harsh conditions of the Sonoran Desert. Many have evolved to have specialized adaptations to the desert climate. The Sonoran Desert's biseasonal rainfall pattern results in more plant species than any other desert in the world. The Sonoran Desert includes plant genera and species from the agave family, palm family, cactus family, legume family, and numerous others. The Sonoran is the only place in the world where the famous saguaro cactus (Carnegiea gigantea) grows in the wild. Cholla (Cylindropuntia spp. ), beavertail (Opuntia basilaris), hedgehog (Echinocereus spp. ), fishhook (Ferocactus wislizeni), prickly pear (Opuntia spp. ), nightblooming cereus (Peniocereus spp. ), and organ pipe (Stenocereus thurberi) are other taxa of cacti found here. Cactus provides food and homes to many desert mammals and birds, with showy flowers in reds, pinks, yellows, and whites, blooming most commonly from late March through June, depending on the species and seasonal temperatures. Creosote bush (Larrea tridentata) and bur sage (Ambrosia dumosa) dominate valley floors. Indigo bush (Psorothamnus fremontii) and Mormon tea are other shrubs that may be found. Wildflowers of the Sonoran Desert include desert sand verbena (Abronia villosa), desert sunflower (Geraea canescens), and evening primroses. Ascending from the valley up bajadas, various subtrees such as velvet mesquite (Prosopis velutina), palo verde (Parkinsonia florida), desert ironwood (Olneya tesota), desert willow (Chilopsis linearis ssp. arcuata), and crucifixion thorn (Canotia holacantha) are common, as well as multi-stemmed ocotillo (Fouquieria splendens). Shrubs found at higher elevations include whitethorn acacia (Acacia constricta), fairy duster, and jojoba. In the desert subdivisions found on Baja California, cardon cactus, elephant tree, and boojum tree occur. The California fan palm (Washingtonia filifera) is found in the Colorado Desert section of the Sonoran Desert, the only native palm in California, among many other introduced Arecaceae genera and species. It is found at spring-fed oases, such as in Anza Borrego Desert State Park, Joshua Tree National Park, and the Kofa National Wildlife Refuge. The Sonoran Desert is home to the cultures of over[quantify] seventeen contemporary Native American tribes, with settlements at American Indian reservations in California and Arizona, as well as populations in Mexico. The largest city in the Sonoran Desert is Phoenix, Arizona, with a 2017 metropolitan population of about 4.7 million. Located on the Salt River in central Arizona, it is one of the fastest-growing metropolitan areas in the United States. In 2007 in the Phoenix area, desert was losing ground to urban sprawl at a rate of approximately 4,000 square meters (1 acre) per hour. The next largest cities are Tucson, in southern Arizona, with a metro area population of just over 1 million, and Mexicali, Baja California, whose municipality also has a population of around 900,000. The municipality of Hermosillo, Sonora, has a population of around 700,000. Ciudad Obregón, Sonora, in the southern part of the desert, has a population of 375,800. The Coachella Valley, located in the Colorado Desert section of the Sonoran Desert, has a population of 365,000. Many famous Southern California desert resort cities such as Palm Springs and Palm Desert are located here. During the winter months, from November to April, the daytime temperatures in the Coachella Valley range from 70 °F (21 °C) to 90 °F (32 °C) and corresponding nighttime lows range from 46 °F (8 °C) to 68 °F (20 °C) making it a popular winter resort destination. Due to its warm year-round climate citrus and subtropical fruits such as mangoes, figs, and dates are grown in the Coachella Valley and adjacent Imperial Valley. Imperial Valley has a total population of about 188,000 and has a similar climate to that of the Coachella Valley. Other cities include Indio, Coachella, Calexico, El Centro, Imperial, Palm Desert and Blythe. Straddling as it does the US-Mexican border, with low levels of human-installed security, the Sonoran desert is a popular route to attempt unauthorized entry across the border. The harsh conditions mean that the 3-5-day march, usually moving at night to minimize exposure to the heat, often ends in death. There are many National Parks and Monuments; federal and state nature reserves and wildlife refuges; state, county, and city parks; and government or nonprofit group operated natural history museums, science research institutes, and botanical gardens and desert landscape gardens. ^ a b "Arizona-Sonora Desert Museum, Tucson, AZ - Zoo, Botanical Garden and Art Gallery". www.desertmuseum.org. Retrieved 15 April 2018. ^ "Sonoran Desert: An Overview of the Sonoran Desert by William G. McGinnies". 21 January 2003. Archived from the original on 21 January 2003. Retrieved 15 April 2018. ^ "Sonoran desert". Terrestrial Ecoregions. World Wildlife Fund. ^ "The Saguaro Cactus" (PDF). nps.gov. Retrieved 15 April 2018. ^ The Sonoran Desert National Monument was created in 2001 in Arizona, to enhance protection of the unique resources of the Sonoran Desert, with 2,008 square kilometers (496,000 acres). :Reference: Sonoran Desert National Monument Archived 2009-01-26 at the Wayback Machine, Bureau of Land Management, U. S. Department of the Interior. Accessed on line June 17, 2009. Wikivoyage has a travel guide for California Desert. Wikimedia Commons has media related to Sonoran Desert. Sonoran Desert and its subdivisions — with photos. "Sonoran desert (World Wildlife Fund)". Terrestrial Ecoregions. World Wildlife Fund.